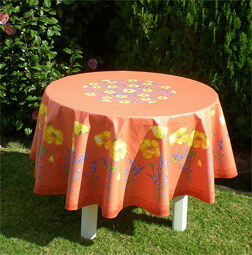 to suit table of any diameter. 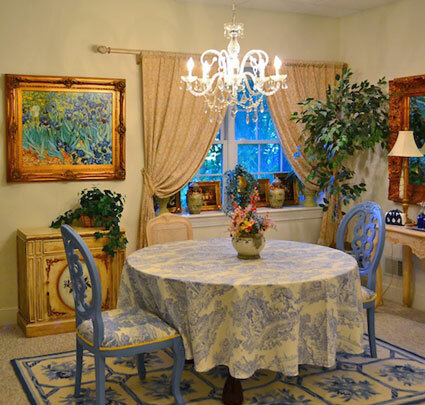 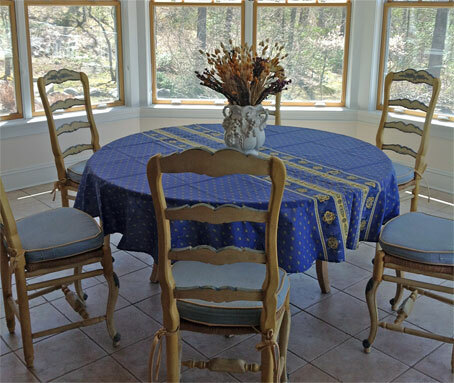 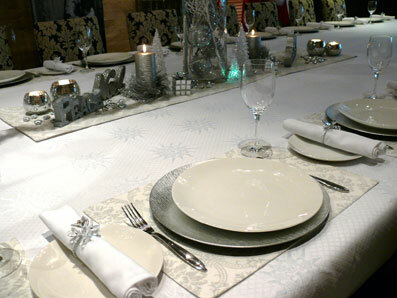 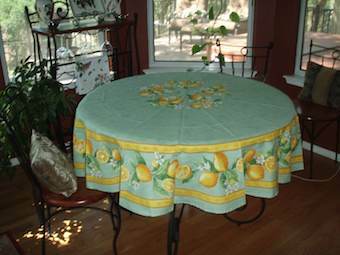 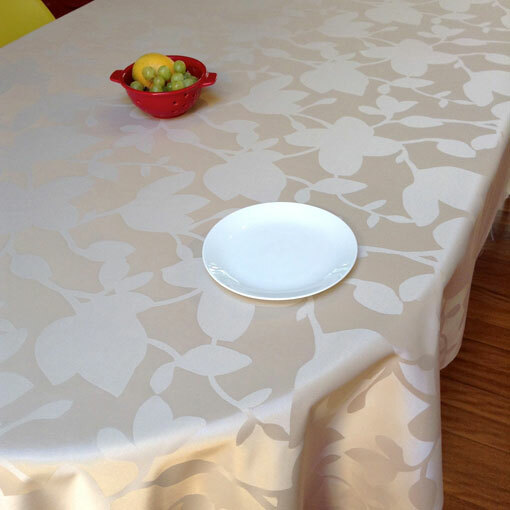 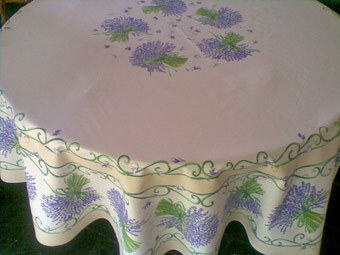 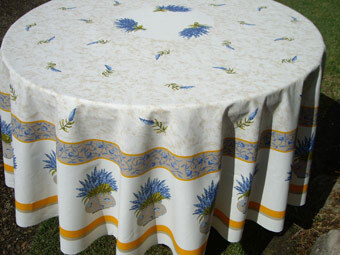 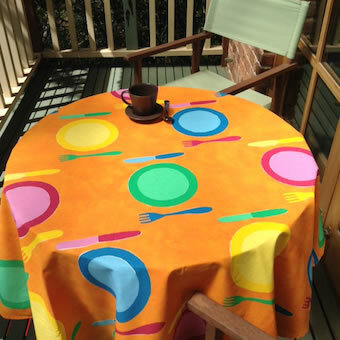 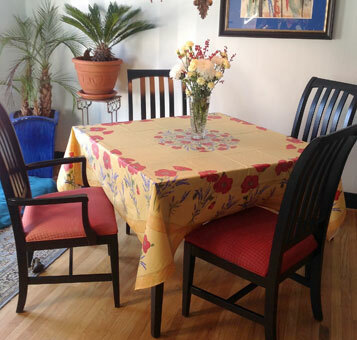 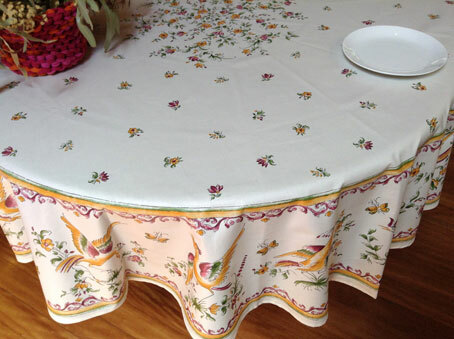 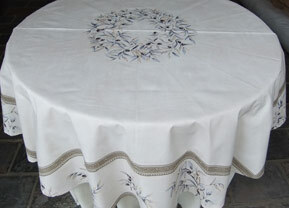 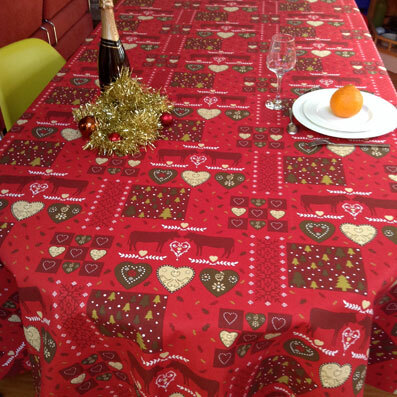 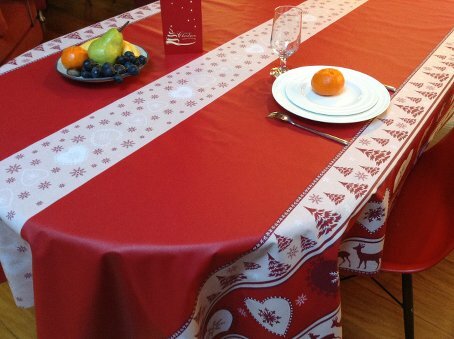 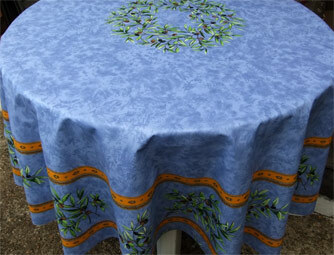 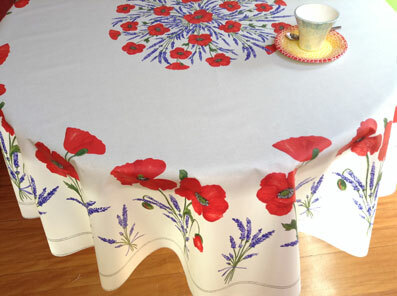 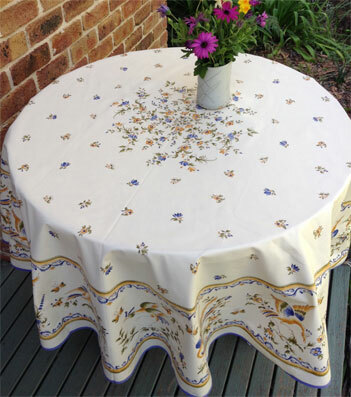 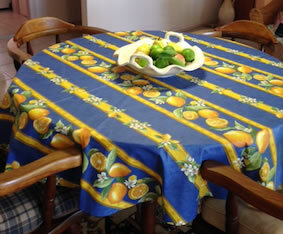 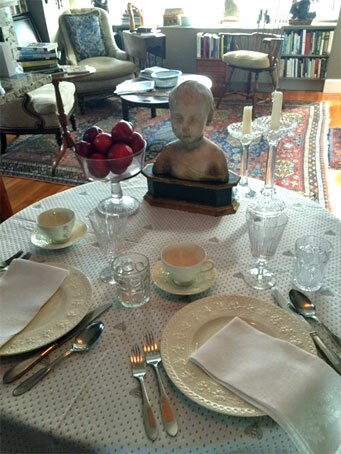 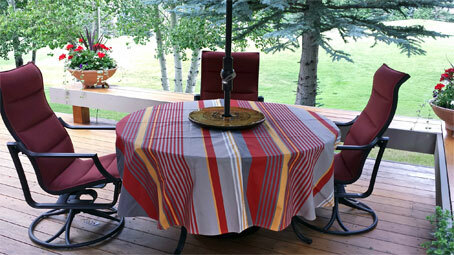 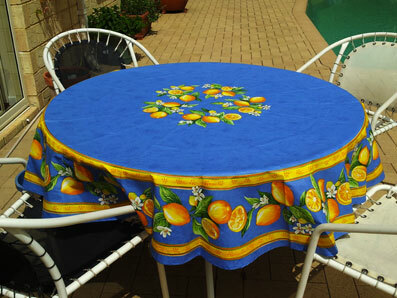 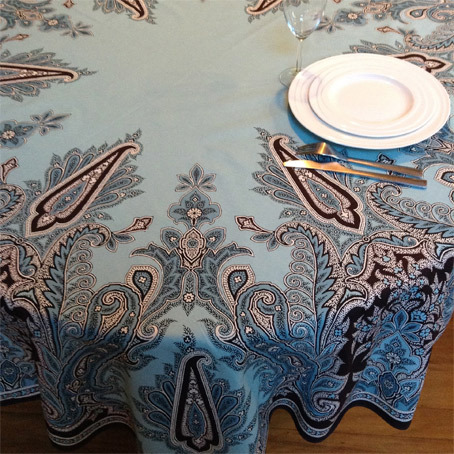 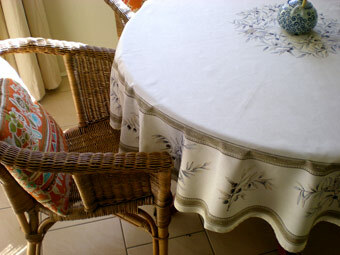 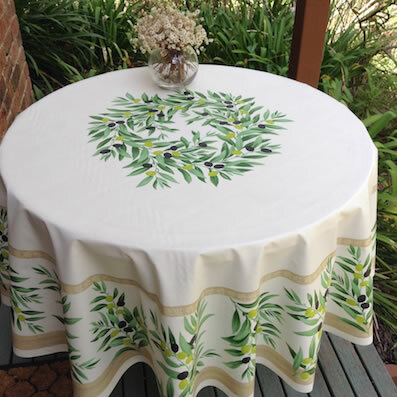 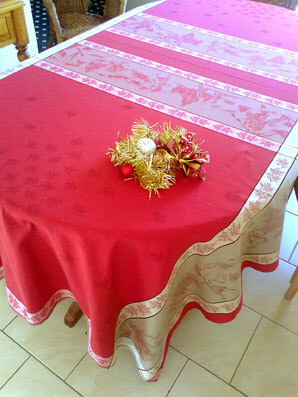 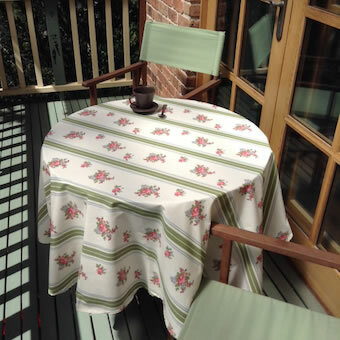 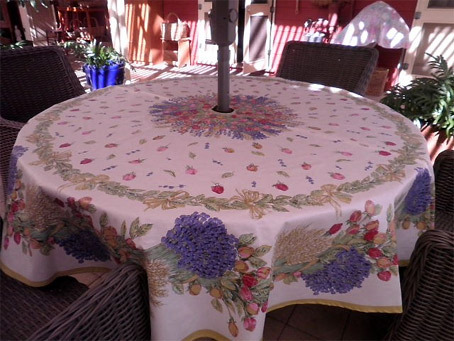 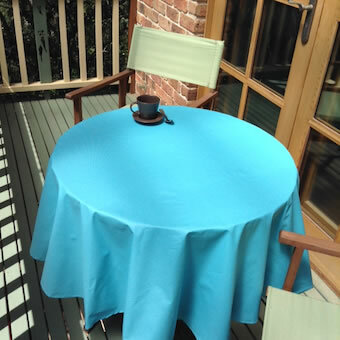 A big "Merci" to all our customers who provided photos of their tablecloths used in this website. 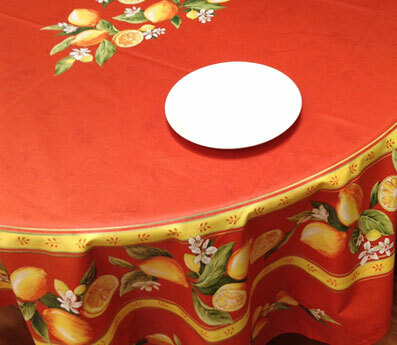 Your are not looking for round cloths ? 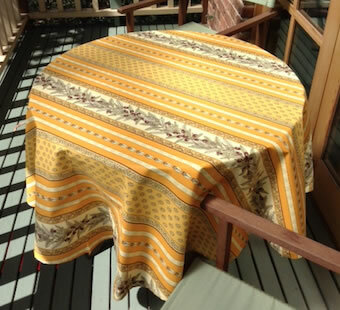 without removing the sun umbrella. 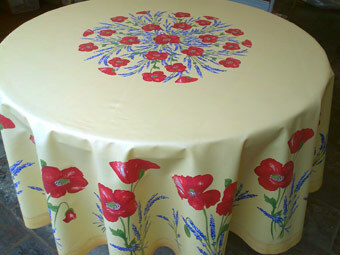 We make round tablecloths in many different sizes. 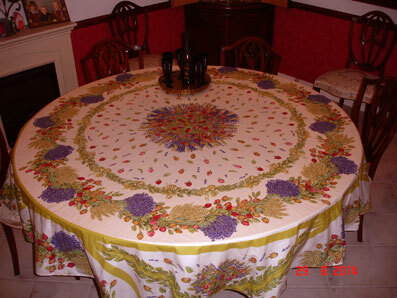 Just email the diameter of your table. 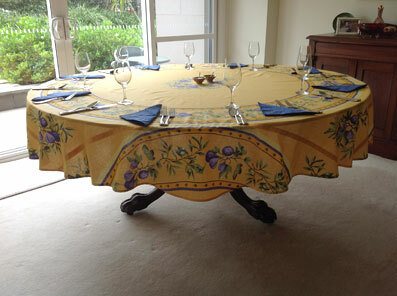 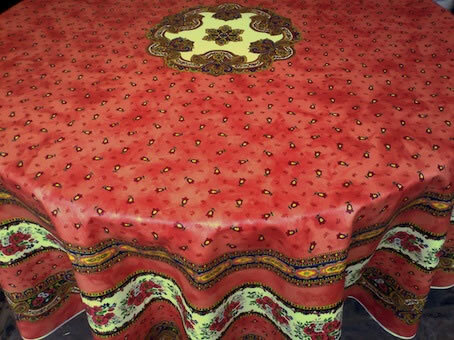 We will be happy to advise you on the dimension of the cloth you need to cover your table well. 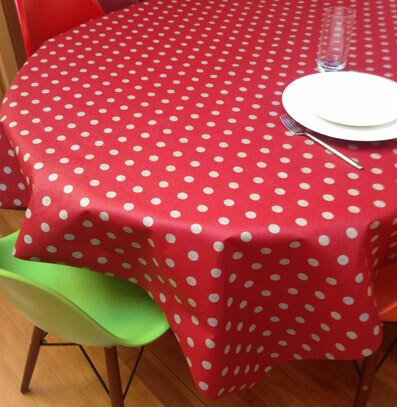 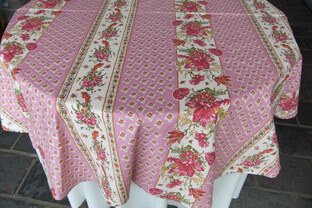 We can make any tablecloth "umbrella friendly"
by adding an umbrella hole and an open-end zipper. 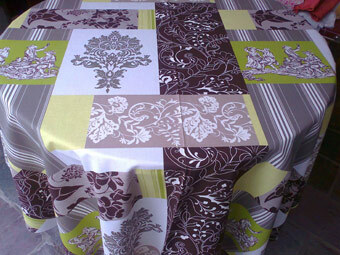 Select the design that you like and contact me for a quote. 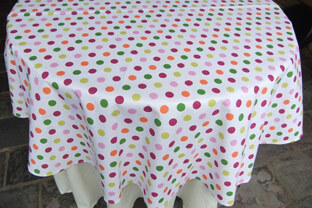 We can make 60in round (150 cm round) acrylic coated tablecloths in all our fabrics, in particular the striped and all-over fabrics that we use to make coated tablecloths. 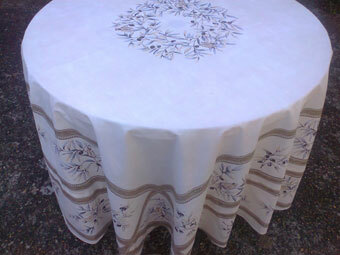 If you need a large round tablecloth we will be happy to make one to your specifications. 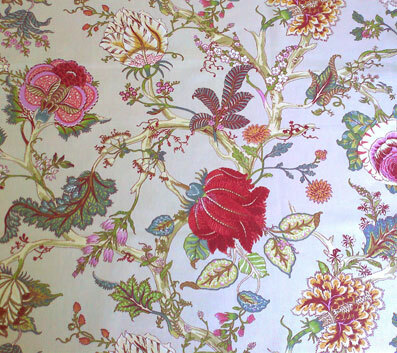 All the toiles de Jouy fabrics are 280 cm or 110 in wide. 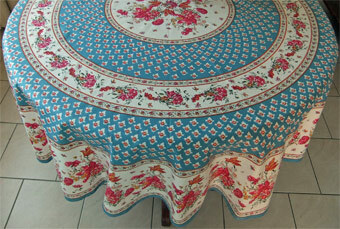 We can make very large round cloths in these toiles. 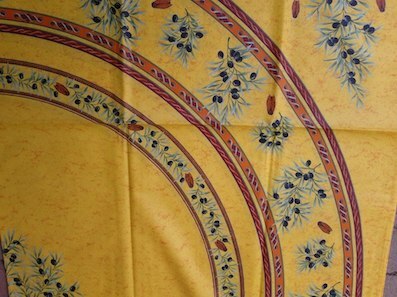 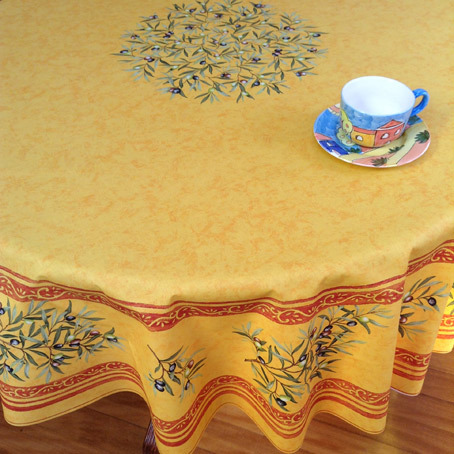 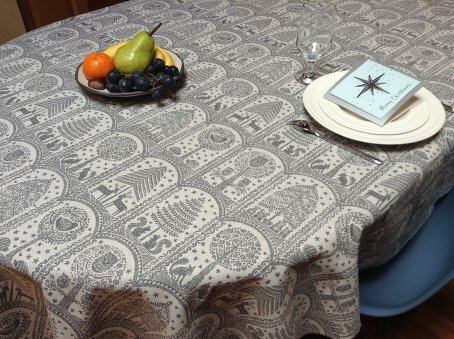 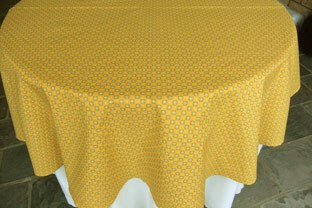 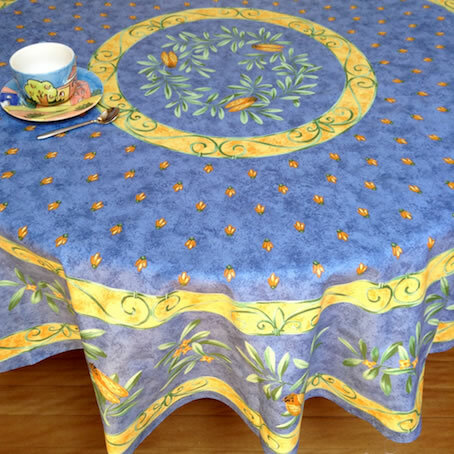 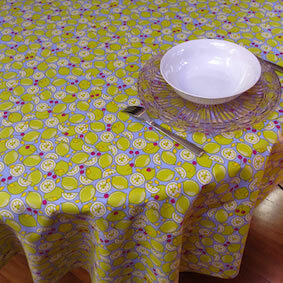 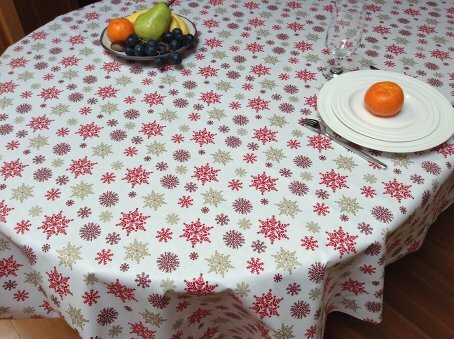 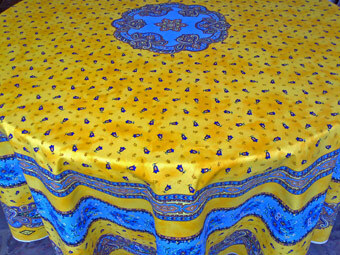 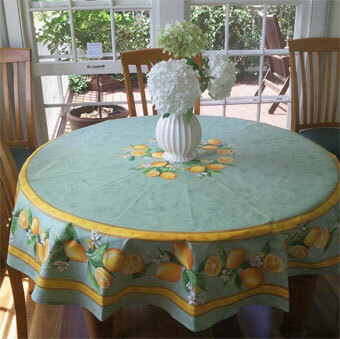 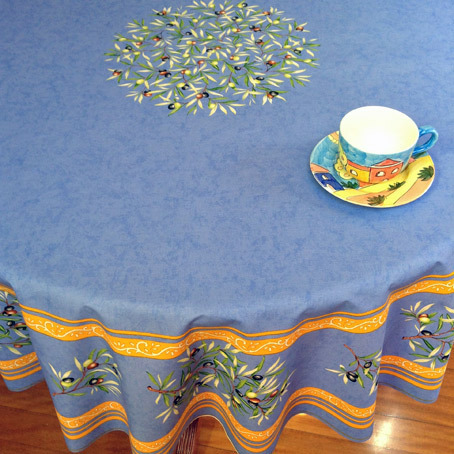 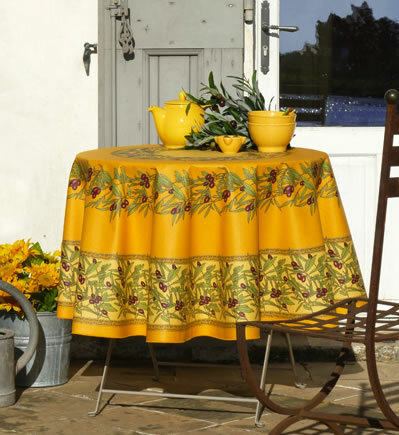 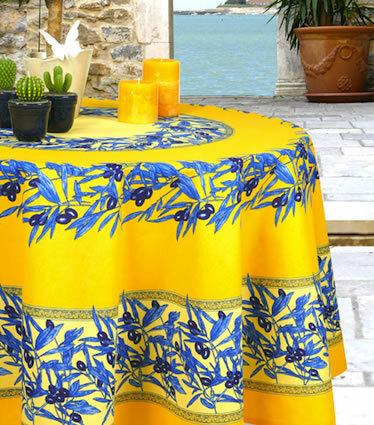 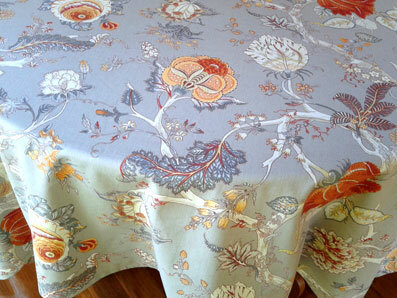 Reversible pique quilted tablecloth with bees designs. 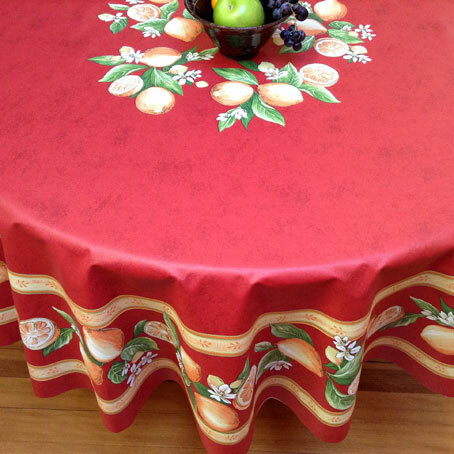 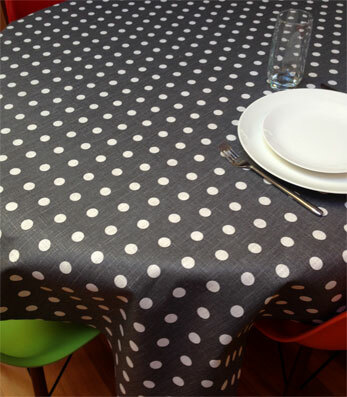 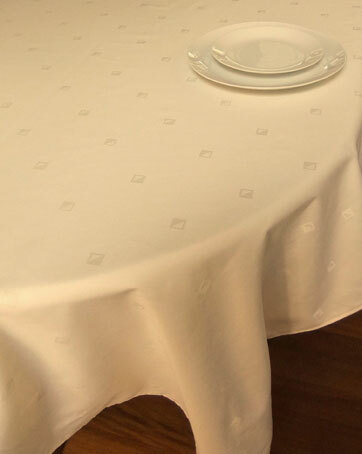 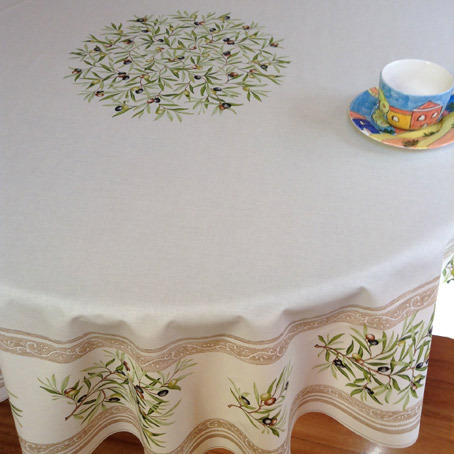 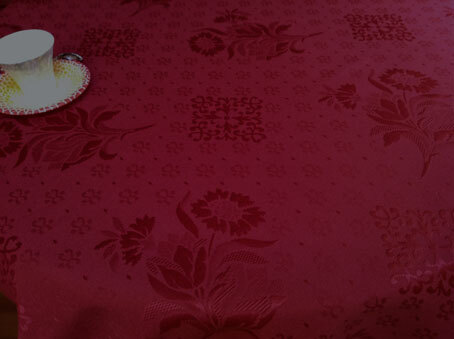 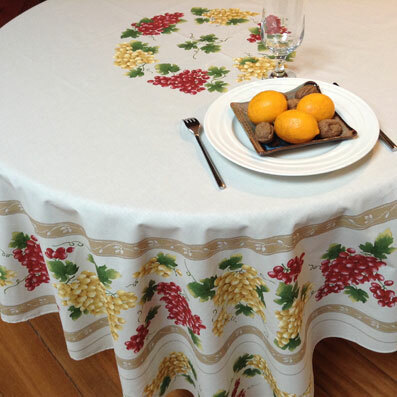 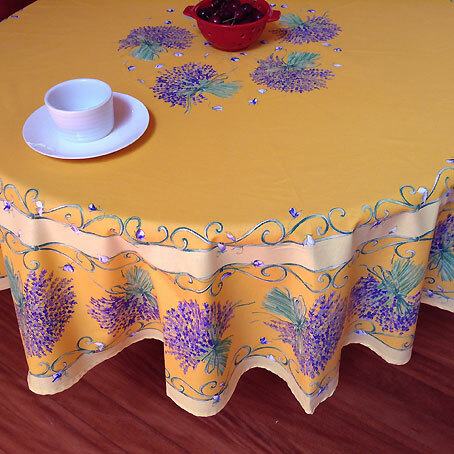 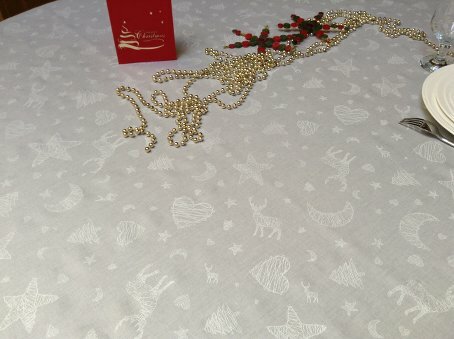 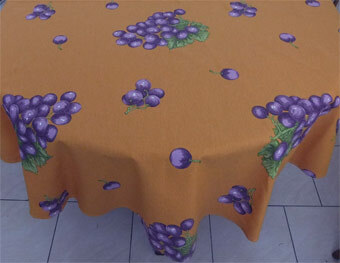 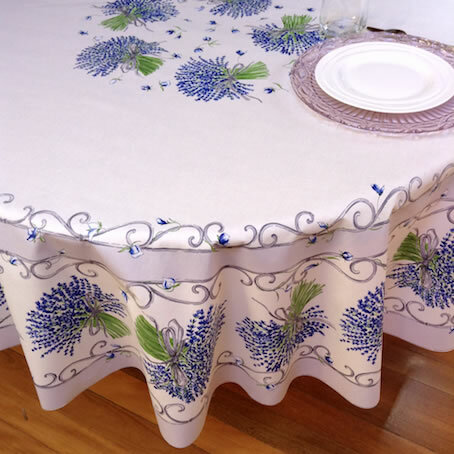 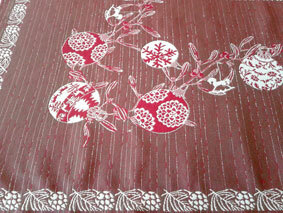 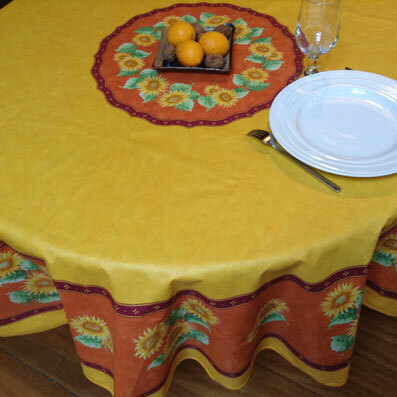 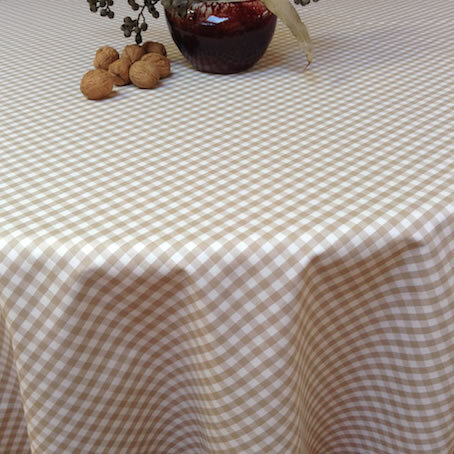 This is a high quality woven tablecloth, very protective for your table, machine washable and dry cleanable. 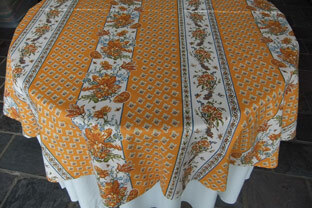 can be made in almost all the cotton fabrics we use to make rectangular cotton cloths. 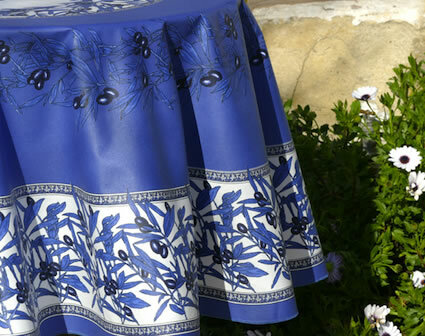 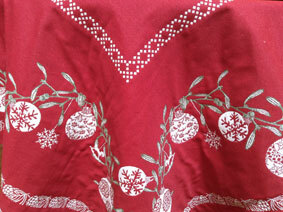 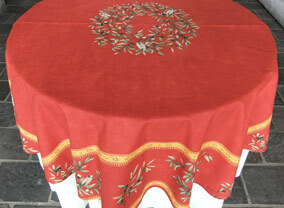 See the Provencal Cloths page of our website. 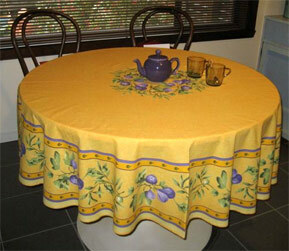 with umbrella hole and open-end zipper. 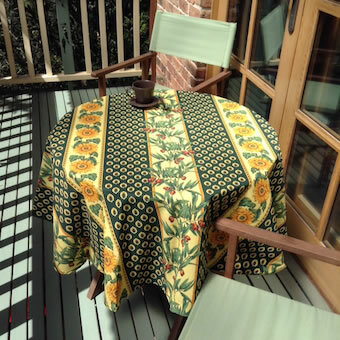 It is an extra $20 on top of the price of your chosen cloth. 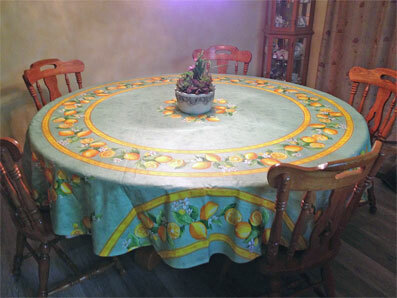 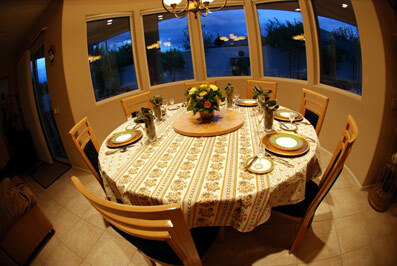 Very large round tablecloth put to good use by Lillian and Mike, Las Vegas. 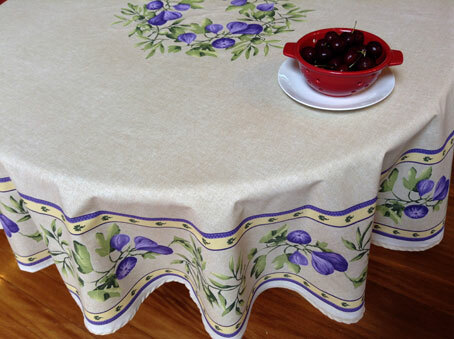 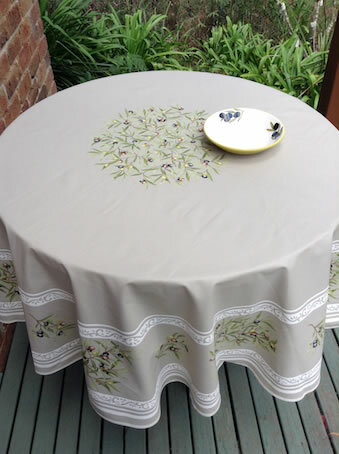 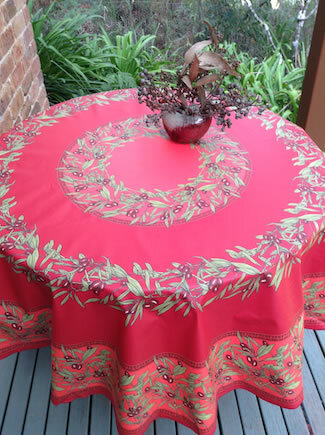 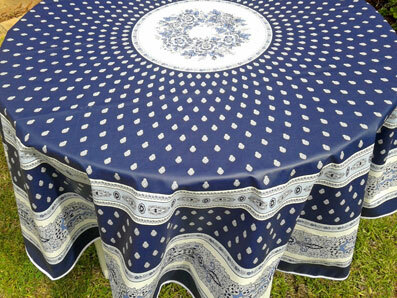 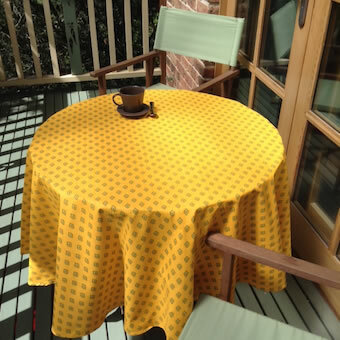 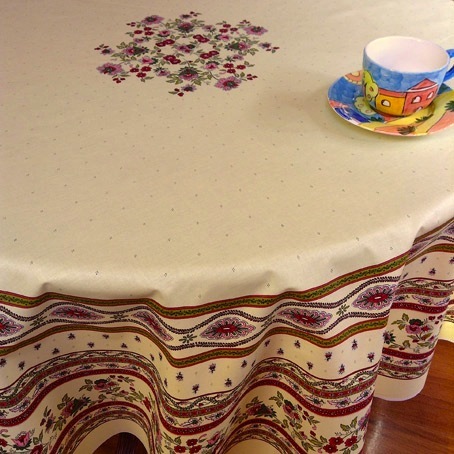 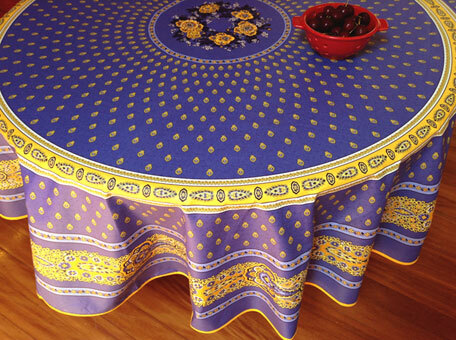 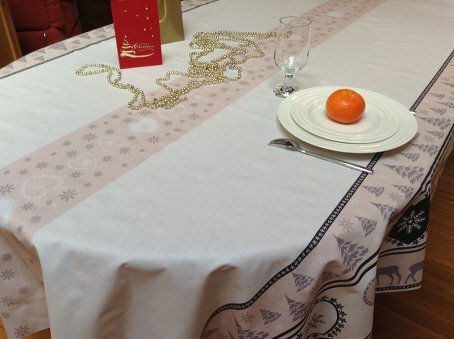 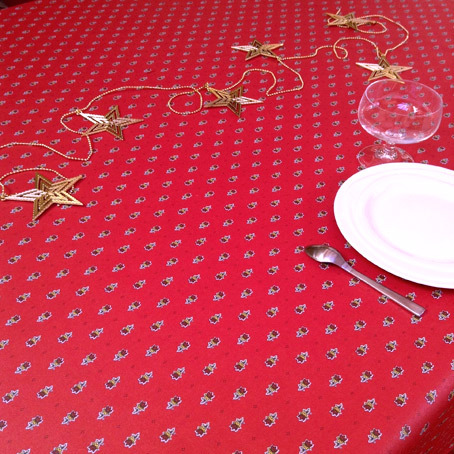 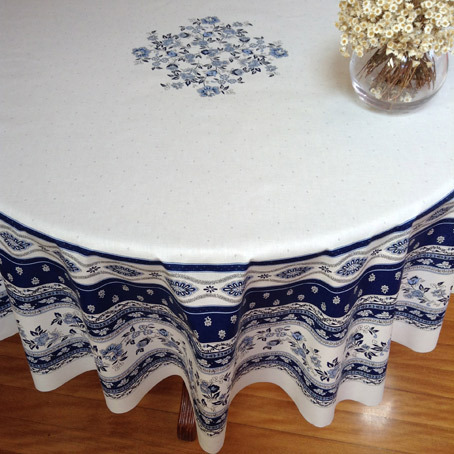 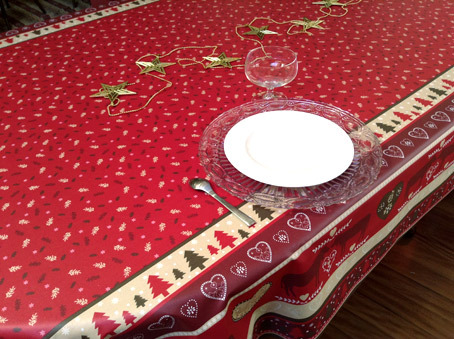 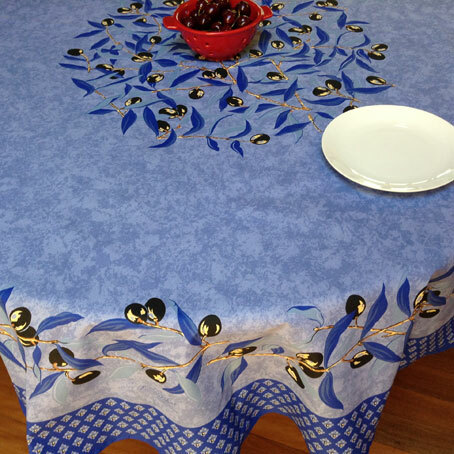 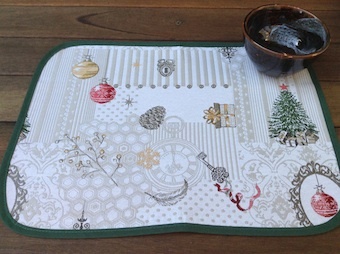 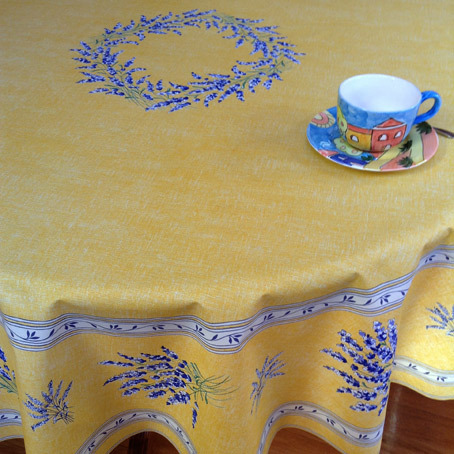 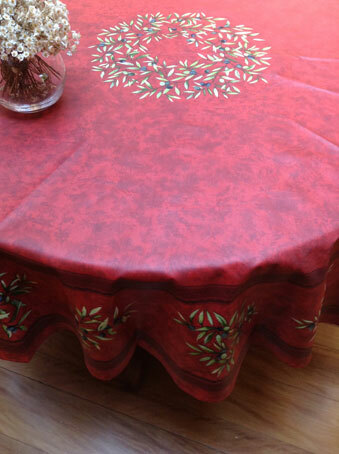 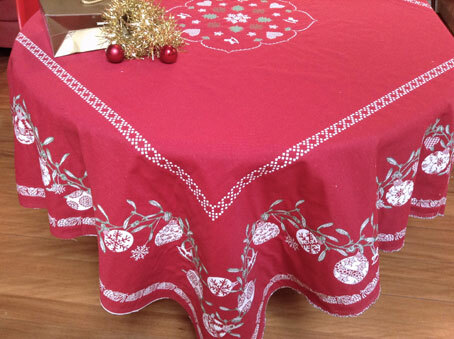 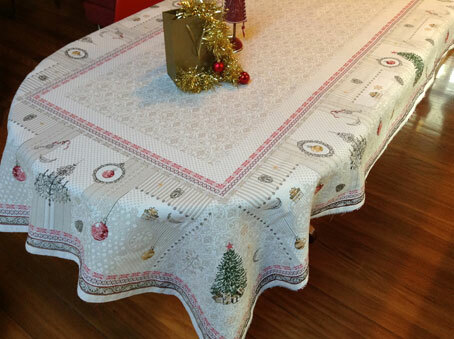 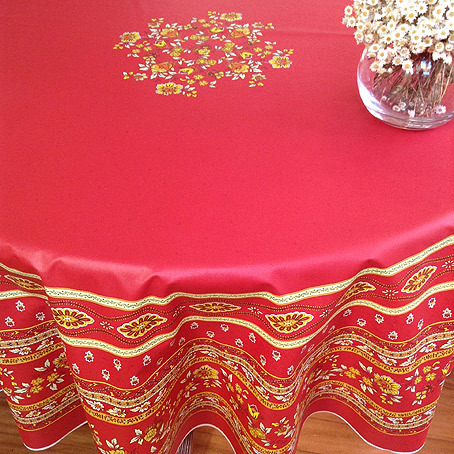 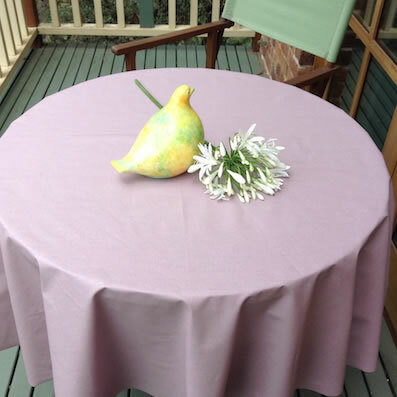 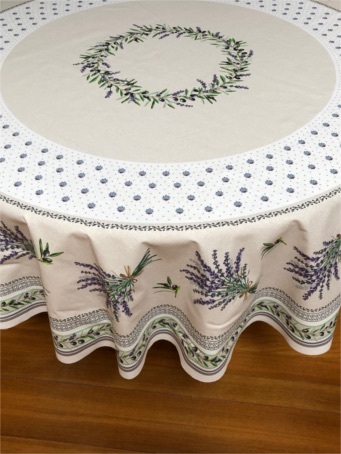 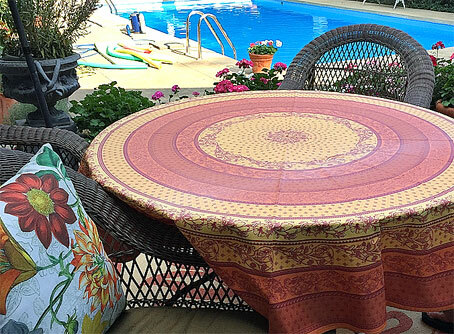 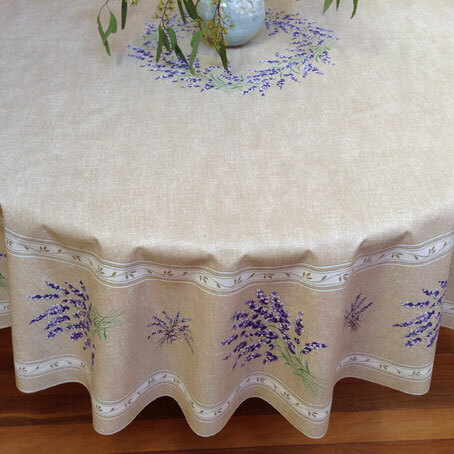 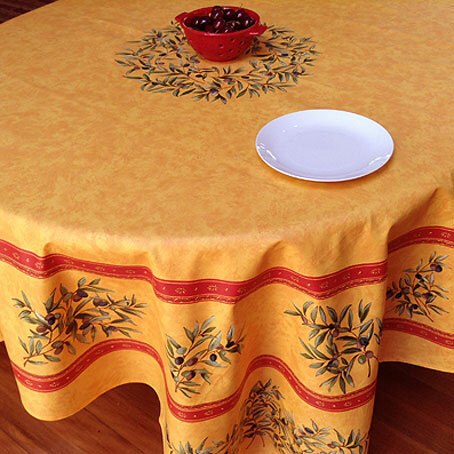 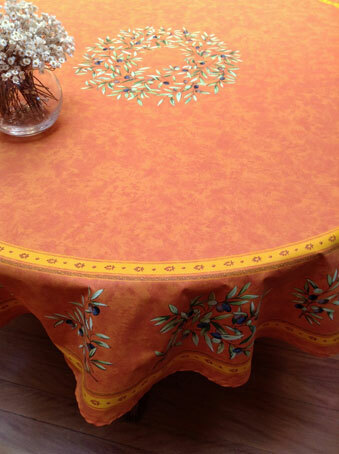 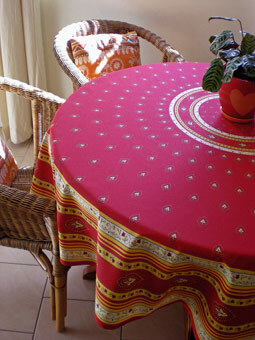 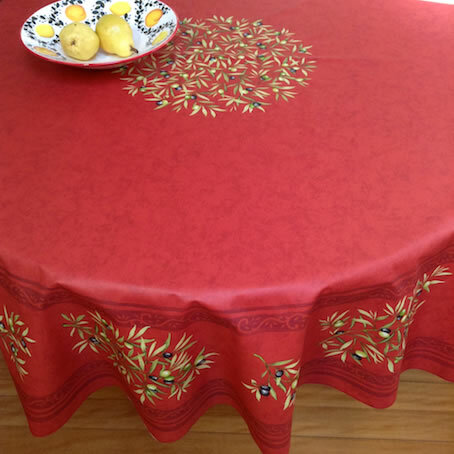 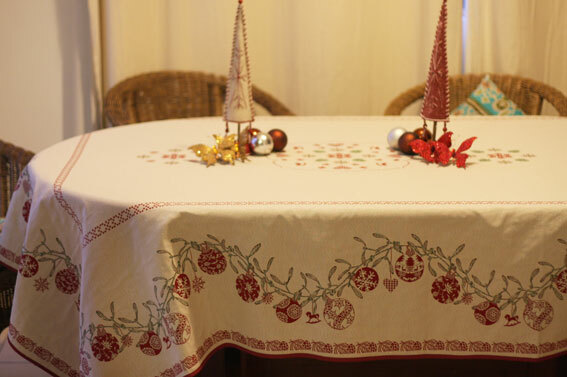 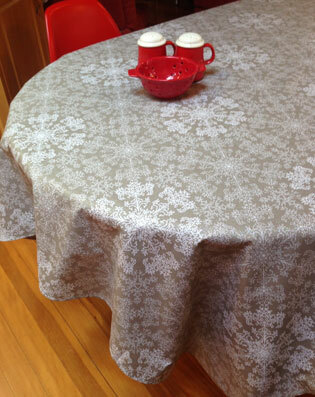 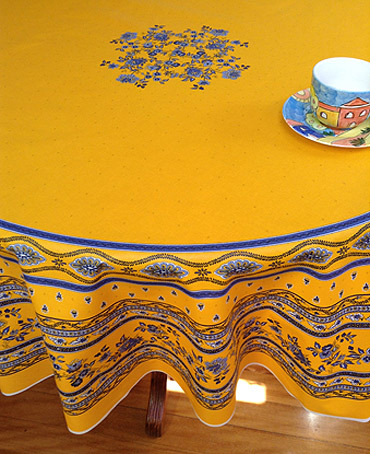 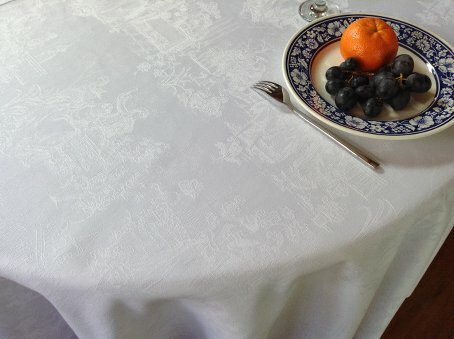 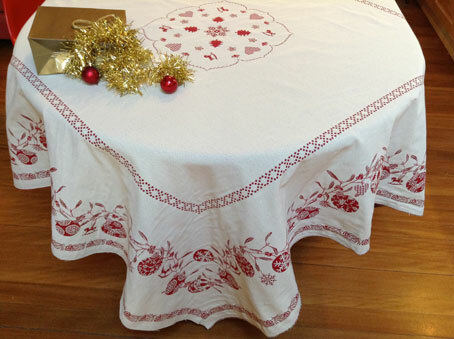 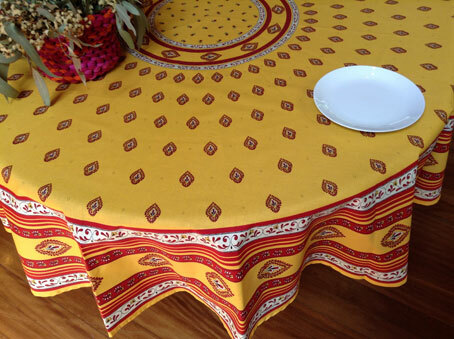 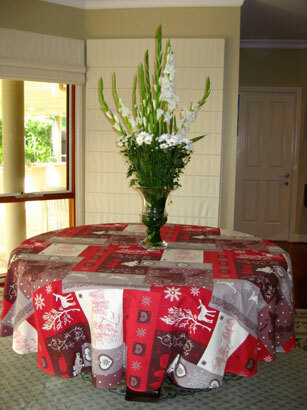 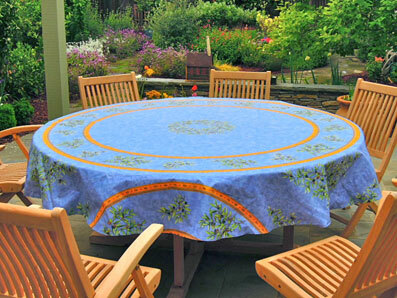 This 88" (240 cm) round tablecloth is made with a built-in runner. 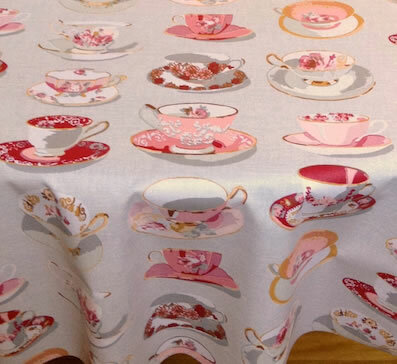 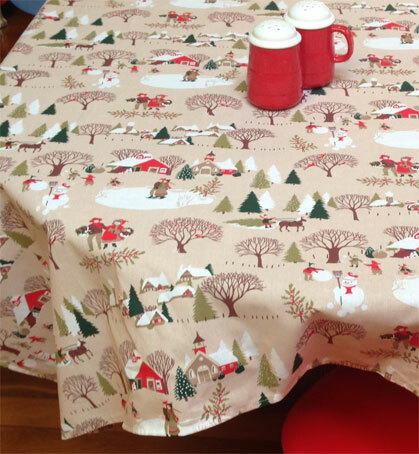 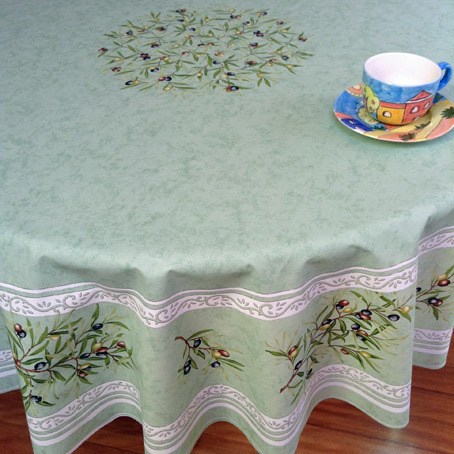 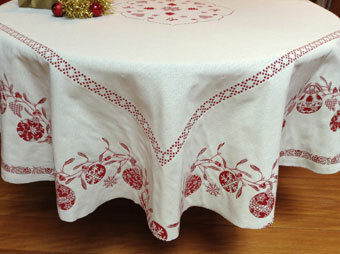 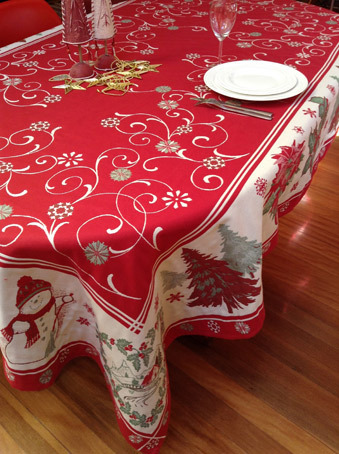 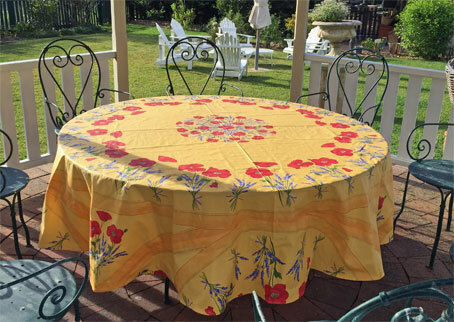 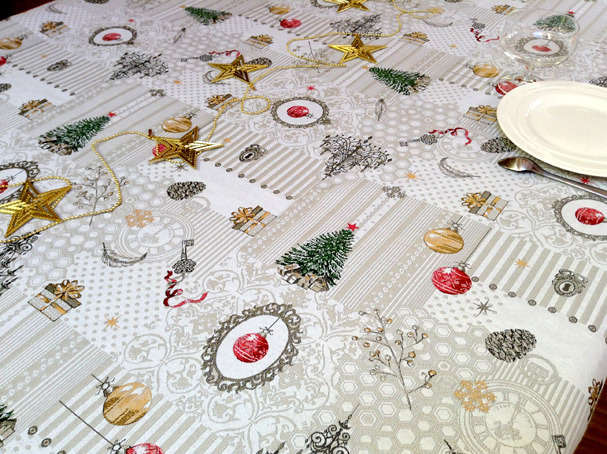 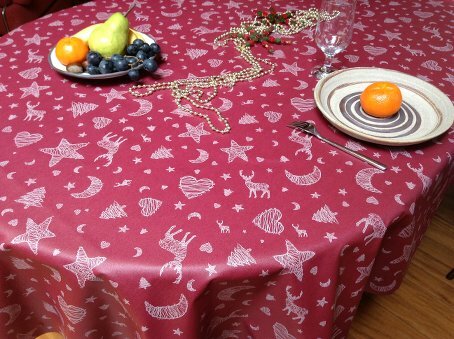 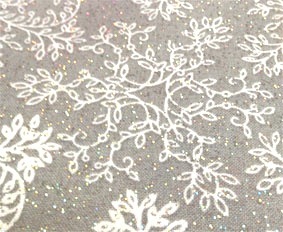 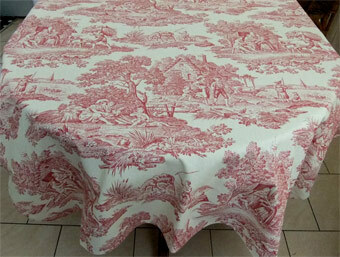 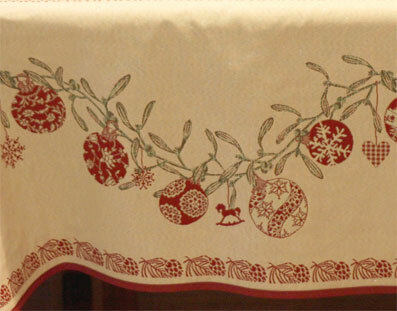 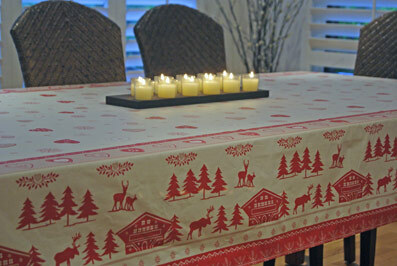 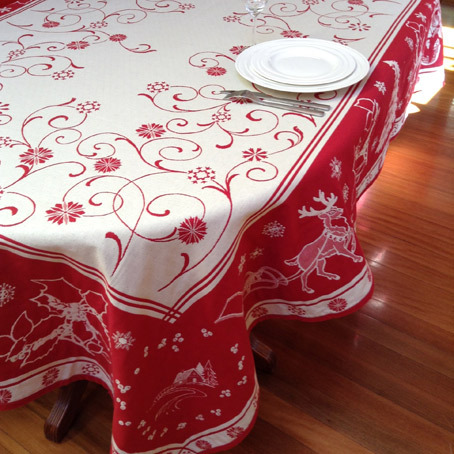 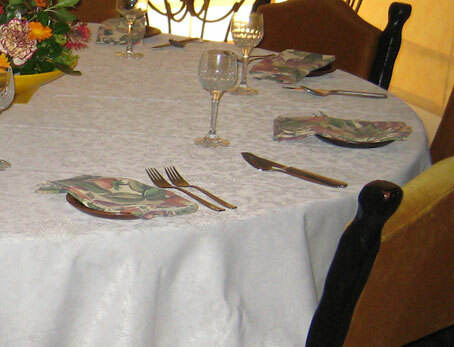 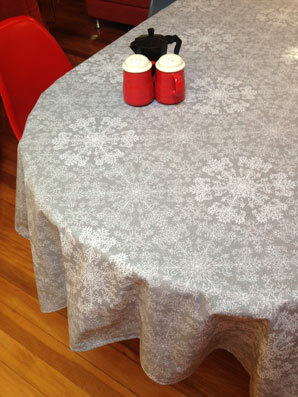 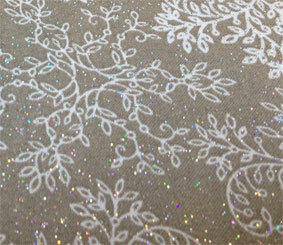 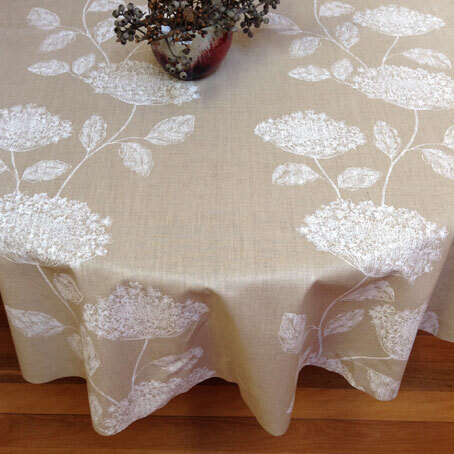 You can see a larger picture in the custom-made tablecloths section of our website. 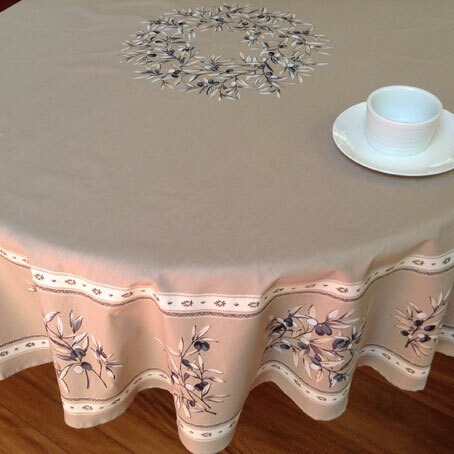 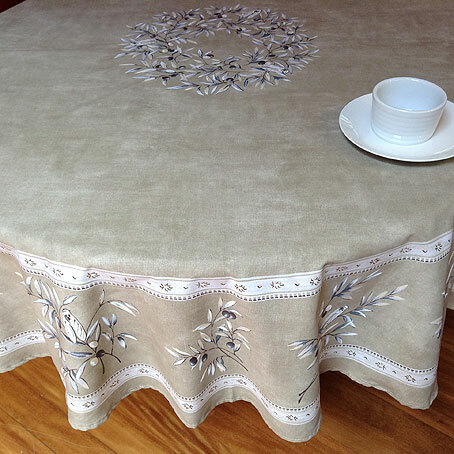 Above picture: 86in round tablecloth (220 cm round tablecloth) in Paquita beige acrylic coatedfabric. 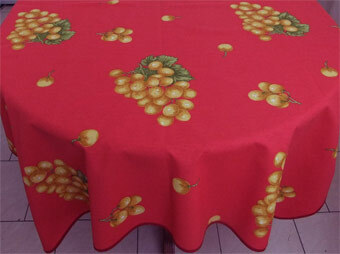 This design is available for 60in (150 cm) round coatd cloths up to 86in round (220 cm round coated cloth). 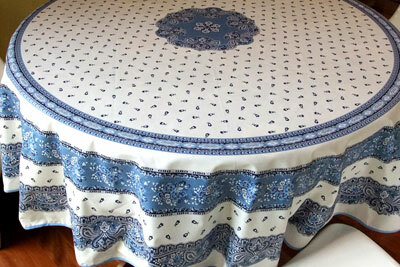 Extra borders have been added around a 60in central panel to get to 86in in diameter. 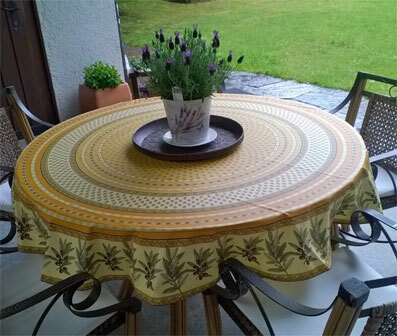 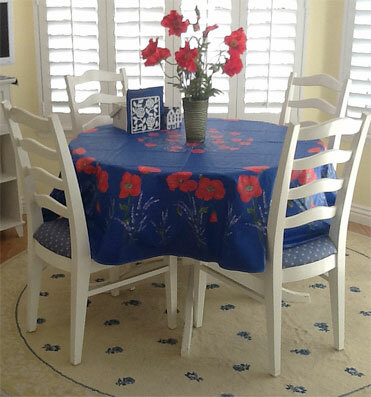 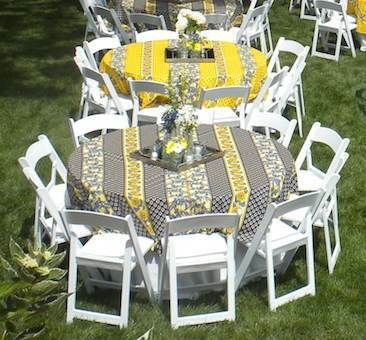 Above picture: 90in round tablecloth (230 cm round tablecloth) in Patricia stripes design. 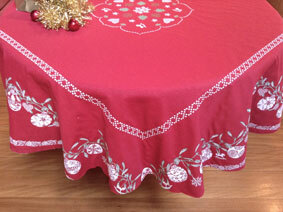 These cloths were made by joining two lengths of a 60in wide fabric. 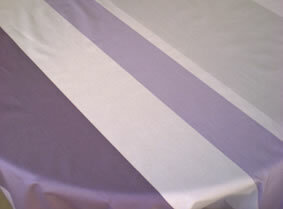 We created a built-in runne to define the centre of the cloths by joining two similar stripes side by side. 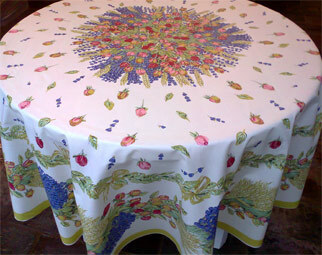 Set up by Margee for a Provencal wedding, USA. 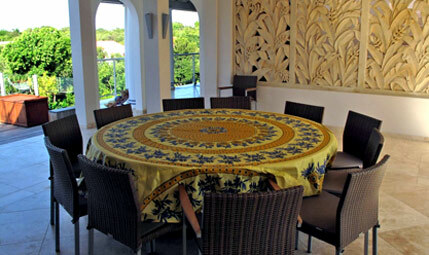 adorning Edie's 10 seater round table in her holiday house in St Martin. 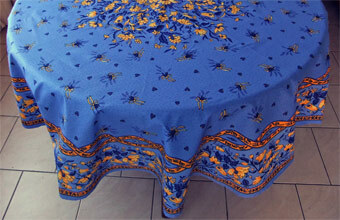 You want to see more cloths and fabrics ?